WallStars all show positive broker target price upsides. 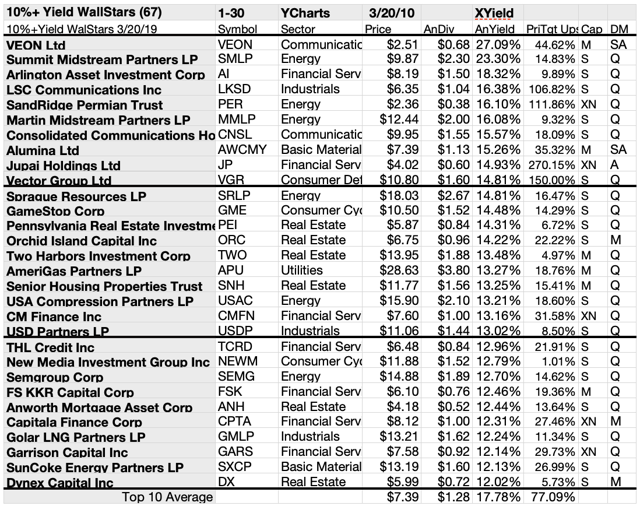 69 stocks displayed 10%+ forward yield, $2.50+ prices, and $100M+ market caps 3/20/19. Yields above 12% winnowed the list to 30. 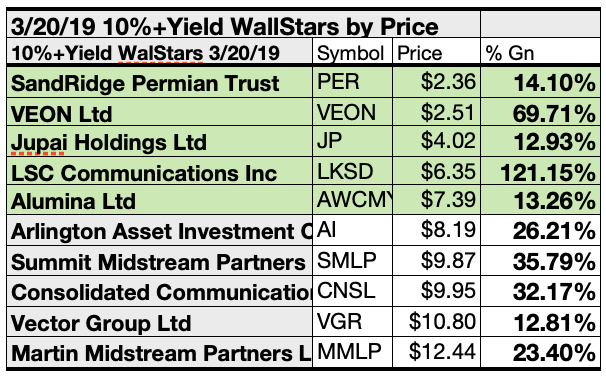 WallStar target estimated Ides Of March top 10 net gain estimates ranged 30.13-121.15% for FSK, CNSL, TCRD, SMLP, SXCP, CPTA, GARS, CMFN, VEON, and top pick, LKSD. 30 Top stocks ranged in estimated annual yield from 12.02% to 27.09%. Top 10 - VGR, JP, AWCMY, CNSL, MMLP, PER, LKSD, AI, SMLP, and top pick, VEON - averaged 17.78% yield. Top 10 firms by WallStar target price upsides - APU, USAC, FSK, TCRD, SXCP, CPTA, GARS, CMFN, VEON, and top stock, LKSD - averaged a 34.69% estimated price gain. 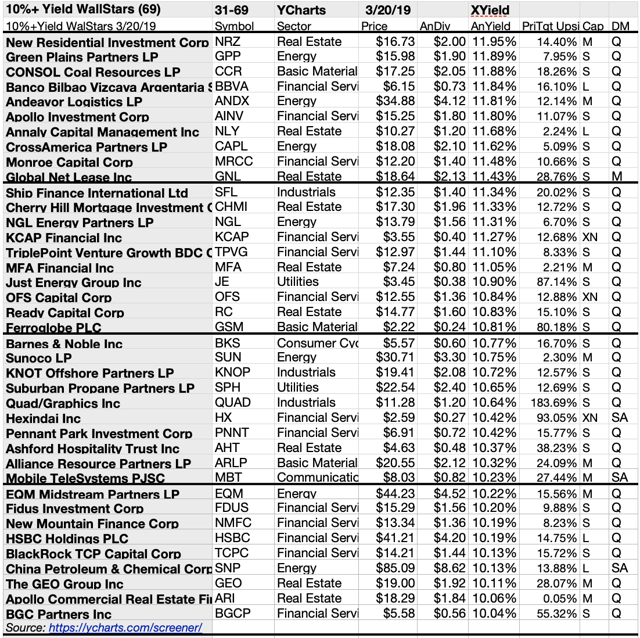 $5k invested 3/20/19 in the lowest-priced five 10%+ top-yield dividend stocks showed 27.87% more projected net gains than from $5k in all 10 per broker targets. The low-priced, smaller WallStars dominated Ides Of March 10%+yield kennel. Four of ten top 10%+Yield WallStars were among the top ten gainers for the coming year (based on analyst one-year targets). So, this forecast for 10%+ yields, as graded by Wall St. Brokers, was 40% accurate. LSC Communications Inc. (LKSD) netted $1,211.50, based on the median of target price estimates from three analysts, plus dividends, less broker fees. A Beta number was not available for LKSD. VEON Ltd. (NASDAQ:VEON) was projected to net $697.1 based on dividends, plus the median of target estimates from fourteen brokers, less broker fees. The Beta number showed this estimate subject to volatility 80% over the market as a whole. CM Finance Inc. (CMFN) was projected to net $427.37, based on the median of target price estimates from two analysts, plus the estimated annual dividend, less broker fees. The Beta number showed this estimate subject to volatility 47% more than the market as a whole. Garrison Capital Inc. (NASDAQ:GARS) was projected to net $394.35, based on dividends, plus the median of target price estimates from five analysts, less broker fees. The Beta number showed this estimate subject to volatility 32% less than the market as a whole. Capitala Finance Corp. (CPTA) was projected to net $383.89, based on a median target price estimate from six analysts, plus dividends, less broker fees. The Beta number showed this estimate subject to volatility 12% more than the market as a whole. SunCoke Energy Partners (SXCP) was projected to net $375.00, based on target price estimates from four analysts, plus dividends, less broker fees. The Beta number showed this estimate subject to volatility 62% over the market as a whole. Summit Midstream Partners LP (SMLP) was projected to net $357.91, based on dividends, plus the median of target price estimates from nine analysts, less broker fees. The Beta number showed this estimate subject to volatility 82% over the market as a whole. THL Credit Inc. (TCRD) was projected to net $328.77, based on a median target price estimate from eight analysts, plus dividends, less broker fees. The Beta number showed this estimate subject to volatility 17% more than the market as a whole. Consolidated Communications (CNSL) was projected to net $321.66, based on the median target price estimates from five analysts, plus the estimated dividends, less broker fees. The Beta number showed this estimate subject to volatility 7% over the market as a whole. FS KKR Capital Corp. (FSK) was projected to net $301.31, based on the median target price estimates from eight analysts, plus the estimated dividends, less broker fees. The Beta number showed this estimate subject to volatility 15% over the market as a whole. The average net gain in dividend and price was estimated at 47.99% on $10k invested as $1k in each of these 10 stocks. This gain estimate was subject to average volatility 12% more than the market as a whole. Stocks earned the "dog" moniker by exhibiting three traits: (1) paying reliable, repeating dividends, (2) their prices fell to where (3) yield (dividend/price) grew higher than their peers. 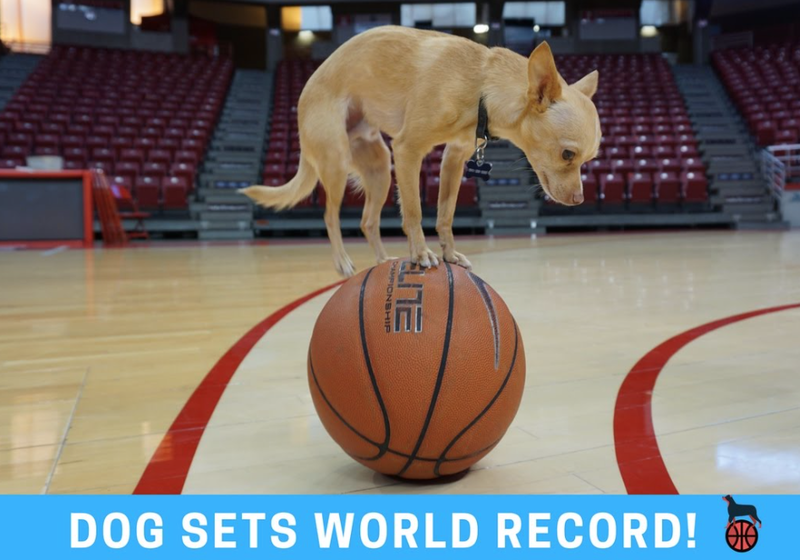 Thus, the highest-yielding stocks in any collection became known as "dogs." More precisely, these are in fact best called "underdogs". Top ten 10%+ Yield WallStars selected 3/20/19 by yield represented six of eleven Morningstar sectors. Top stock on the list was one of two in the communication services sector, VEON Ltd. ; the other was in seventh place, Consolidated Communications Holdings Inc. .
Three energy stocks followed in second, fifth and sixth places, Summit Midstream Partners LP , SandRidge Permian Trust (PER) , and Martin Midstream Partners LP (MMLP) . A pair of financial services representatives placed third and ninth, Arlington Asset Investment Corp (AI) , and Jupai Holdings Ltd (JP) . One in the industrials sector placed fourth, LSC Communications Inc. . Finally, one in basic materials placed eighth, Alumina Ltd. (OTCQB:AWCMY) , which was followed by the lone consumer defensive sector representative in tenth, Vector Group Ltd. (VGR) , to complete the 10%+ Yield WallStar top ten for Ides Of March 2019-20. Actionable Conclusions: (21) Top Ten 10%+ Yield WallStars Showed 24.24% To 106.27% Upsides To Ides Of March 2020; (22) Lowest Downside Had Seven at 0%. To quantify top yield rankings, analyst mean price target estimates provided a "market sentiment" gauge of upside potential. Added to the simple high-yield metrics, analyst mean price target estimates became another tool to dig out bargains. Ten top 10%+ Yield WallStars were culled by yield for this Ides of march update. Yield (dividend/price) results verified by Yahoo Finance did the ranking. 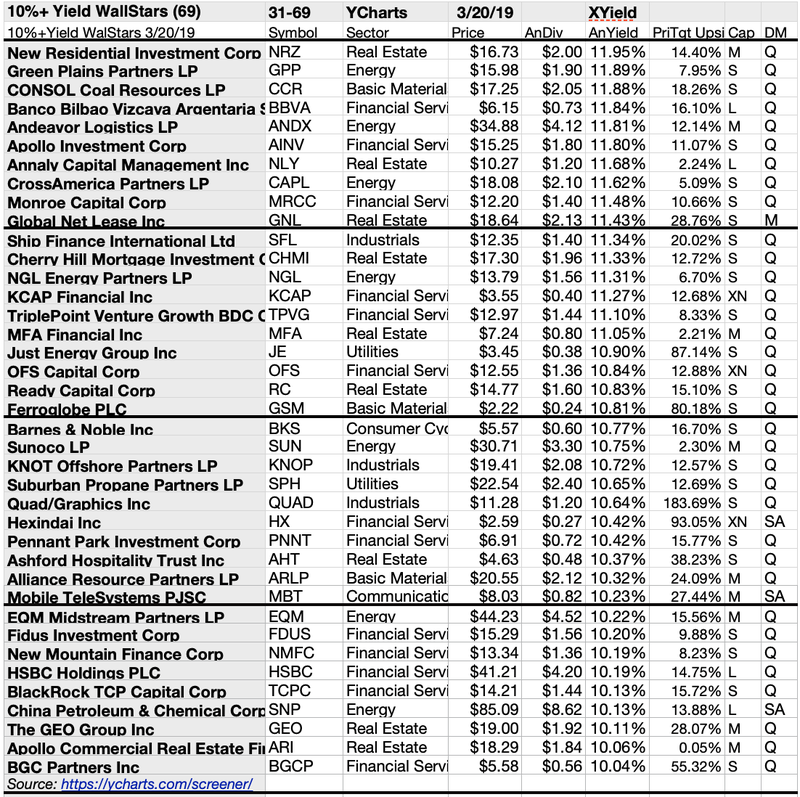 As noted above, top ten 10%+ Yield WallStars selected 3/20/19 showing the highest dividend yields represented six of eleven sectors in the Morningstar scheme. 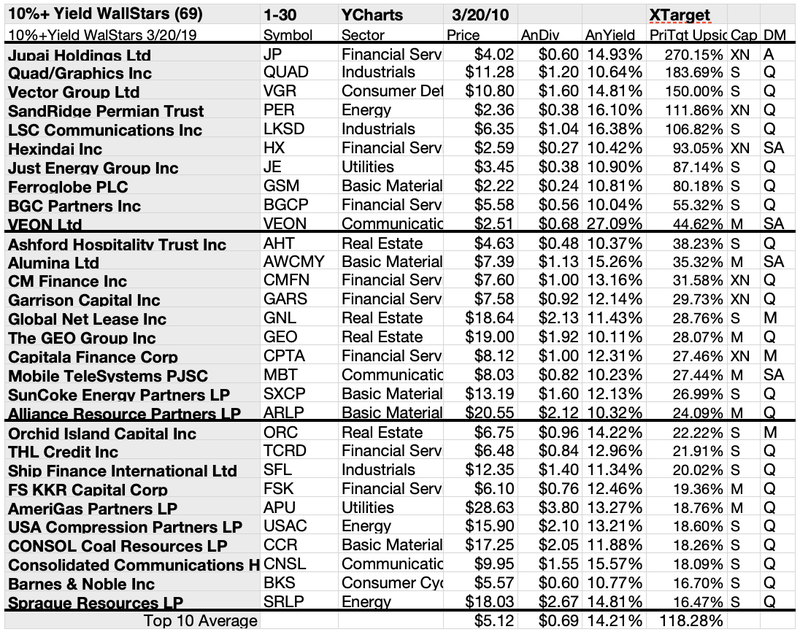 $5,000 invested as $1k in each of the five lowest-priced stocks in the top ten 10%+ Yield WallStars collection was expected by analyst one-year targets to deliver 27.87% more net gain than $5,000 invested as $.5k in all ten. 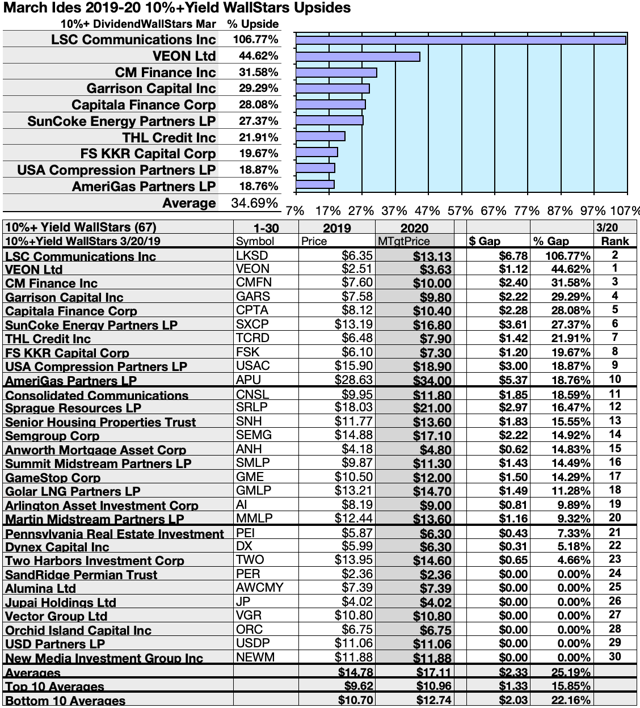 The fourth lowest priced 10%+ top yield WallStar, LSC Communications, was projected by analysts to deliver the best net gain of 121.15%. The five lowest-priced top 10%+ Yield stocks as of March 20 were: SandRidge Permian Trust, VEON, Jupai Holdings, LSC Communications, and Alumina, with prices ranging from $2.36 to $7.39. 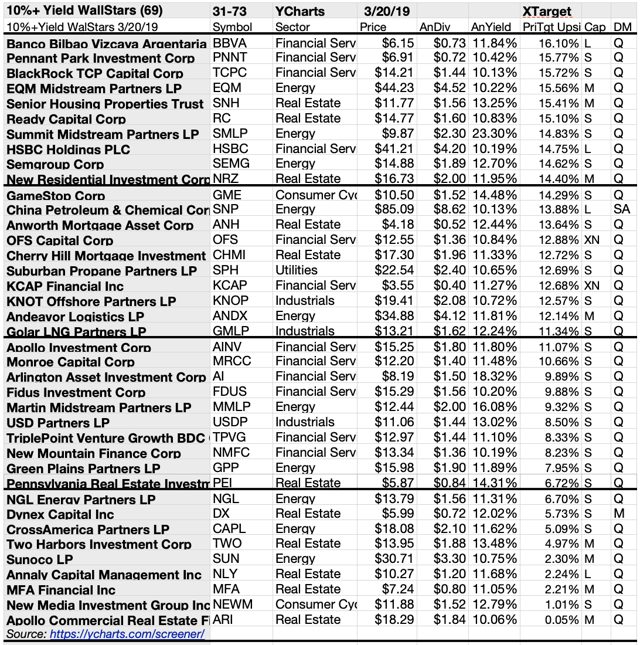 Five higher-priced 10%+ Dividend WallStars from March 20 were: Arlington Asset Investment, Summit Midstream Partners, Consolidated Communications Holdings, Vector Group, and Martin Midstream Partners, whose prices ranged from $8.19 to $12.44. The distinction between five low-priced dividend dogs and the general field of ten reflected Michael B. O'Higgins' "basic method" for beating the Dow. The scale of projected gains based on analyst targets added a unique element of "market sentiment" gauging upside potential. It provided a here-and-now equivalent of waiting a year to find out what might happen in the market. Caution is advised, since analysts are historically only 20% to 80% accurate on the direction of change and just 0% to 20% accurate on the degree of change. The net gain/loss estimates above did not factor in any foreign or domestic tax problems resulting from distributions. Consult your tax advisor regarding the source and consequences of "dividends" from any investment. Stocks listed above were suggested only as possible reference points for your 10%+ Yield WallStar purchase or sale research process. These were not recommendations. Click here to subscribe to The Dividend Dogcatcher. Get a free trial, more information, and the follow-up to this article. Catch A Dog On Facebook At 8:45 AM every NYSE trade day on Facebook/Dividend Dog Catcher, in the Underdog Daily Dividend Show! Root for the Underdog. Comment below on any stock ticker to make it eligible for my next FA follower report. Additional disclosure: This article is for informational and educational purposes only and should not be construed to constitute investment advice. Nothing contained herein shall constitute a solicitation, recommendation or endorsement to buy or sell any security. Prices and returns on equities in this article except as noted are listed without consideration of fees, commissions, taxes, penalties, or interest payable due to purchasing, holding, or selling same.